Widely regarded as the first ever heavy metal album. The cover photo was taken in front of Mapledurham Watermill in Oxfordshire, England. 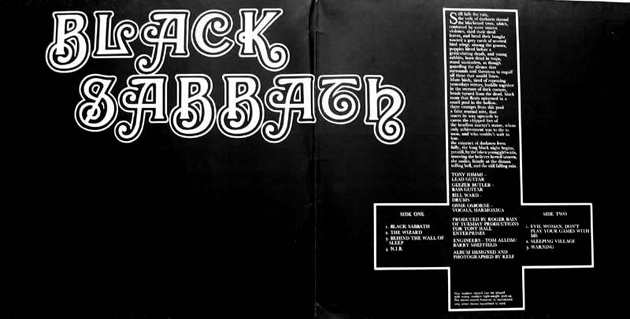 The original gatefold vinyl cover displays an inverted cross on the inside. The band members have always maintained that this was done by the record label, without their knowledge or permission. This got the band some (unwanted) attention by occult groups, so they all started wearing crucifixes around their necks to avoid being labelled as Satanists. "N.I.B." does not stand for "Nativity in Black". It was referring to Bill Ward's facial hair, which looked like a pen nib. "Evil Woman" and "Warning" are both blues covers, "Evil Woman" originally by the American band Crow (which was why publishing rights prohibited it from being on the American release), while "Warning" was originally by the short lived Aynsley Dunbar Retaliation, in a much shorter form. Ironically enough, Ozzy Osbourne misheard the song and sings "I was born without you baby" instead of "I was warned about you baby", which was the entire basis for the song and reason it was called "Warning". Castle Communications '80s version of the album contains a live version of "Tomorrows Dream" (3:04) as track eight taken from the Live at Last live album. The '96 Castle Communications remaster uses the original track listing, plus "Wicked World" as track 8, being the first release with both songs on one disc.